Double Flying Dragons on stand - Bok Lei Po Trading Inc. 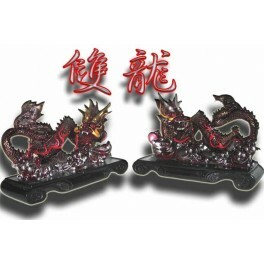 Double Flying Dragons-those double flying dragons on stand are made of soft stone. Very colorful with detail design. it is nice to have to decoration your office or home. size 9"Wx5 1/2"Hx3"D. Sold by Pair.